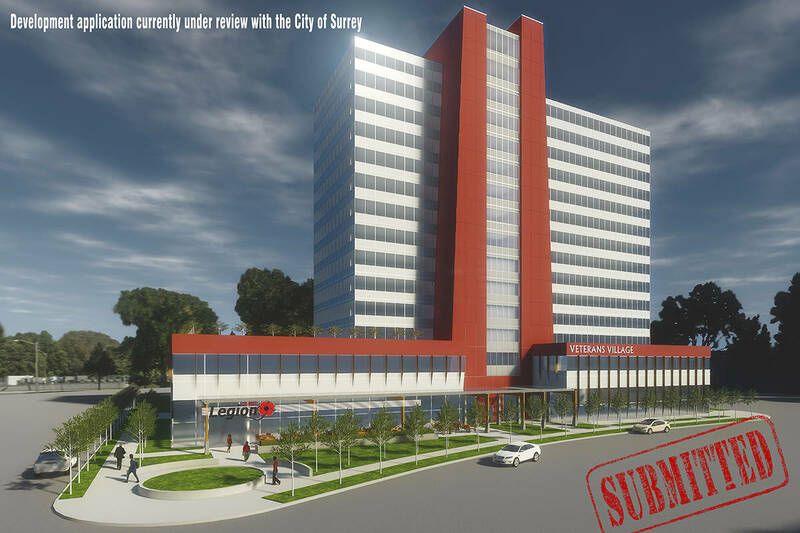 According to an article published this week in the Surrey Now-Leader, a development application has finally been submitted for the much anticipated Veterans Village project on the site of the Whalley Legion at 13525 106 Ave. First announced back in 2015 as a 2-tower project resembling the Canadian National Vimy Memorial, the project has since gone through 2 major design revisions to become what is now a much less ambitious single-tower project. 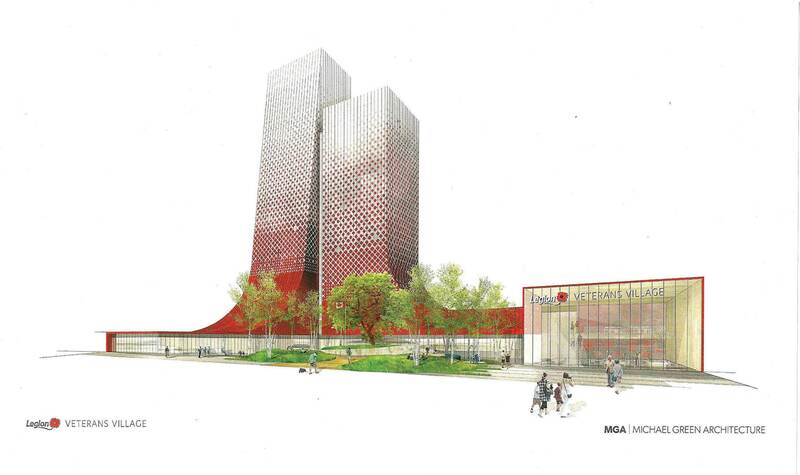 The new design by Wensley Architecture still incorporates reference to the Vimy Memorial, but has been significantly scaled-back from the previous 2-tower concept. The proposal now more closely resembles the City Centre I & II towers by the same developer and architect near Surrey Memorial Hospital. The tower is intended to serve as a facility where veterans, soldiers and emergency first-responders will be treated for post-traumatic stress disorder and other mental health-related concerns. It will also include a research and rehabilitation centre, as well as temporary housings for patients and their families, a healing garden and new legion lounge. Aside from the design of the building itself, the project will be transformative for the area it is located within. Situated on 106 Ave between City Parkway and 135A St, the project is adjacent to the infamous 135A Strip to the east, with its homelessness and drug problems. To the west however is Tom Binnie Park, the BC Lions Training Facility. In response to this interface, the building is proposed to face west and front onto City Parkway, with its back and a temporary parking lot to face the east side of the site along 135A St until homeless problems can be addressed. The City of Surrey currently has a number of initiatives underway to address the problem on 135A, which includes new shelters and interim housing for this population elsewhere in the city. As per the City Centre Plan for the area, a new east-west road (106A Ave) is proposed to be dedicated along the north side of the project, and shown in project renderings. This would result in the building site being surrounded by roads on all 4 sides. The project’s City Parkway frontage will further develop this key urban street running north-south through City Centre connecting Gateway to Surrey Central. According to the Surrey-Now Leader article, the project is expected to be fast-tracked through the City approvals process under the newly implemented ‘Nexus’ program, and appear before Council by February. If all goes well, the project could break ground as early as Spring 2018.